Our new low to medium profile, structured trucker hat is now available. Structured hats have not been Salt-washed™ for softness and fading. These hats are more stiff and the colors are brighter. 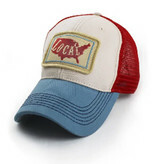 The fit profile is very similar to our popular vintage-style Salt-washed™ trucker hats. Adjustable snap in the back allows for a proper fit and we have color-blocked this style with a mesh color, front panel color and bill color. We think we have designed a hat with a unique look and should be a favorite.